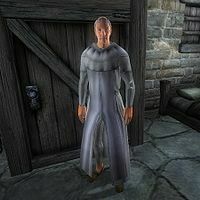 Brother Hridi is a Nord Moth Caretaker residing at the Temple of the Ancestor Moths in the Jerall Mountains north of Cheydinhal. Hridi is the one maintaining the sparse amount of crops in the settlement and, according to random conversation from both Brother Holger and Brother Hjar, the one responsible for the harvested silk from the Ancestor Moths. Like the other monks, he sleeps in the Monk's Quarters every night between 10pm and 6am. After waking up, he takes a two-hour breakfast then heads to the local chapel for a silent prayer. At 1pm, he ventures outside, pulls out his hoe and works the land just outside the Quarters. At 6pm he enters the Quarters and strolls around until 8pm when he takes a two-hour dinner before bedtime. He is garbed in the traditional white monk robes of the Ancestor Moth, along with a pair of clogs. He carries the key to the Temple, a small amount of gold and a hoe. When asked about the monks who guard Savilla's Stone, he supplies, "They live in utter darkness in the secret catacombs. Of course it doesn't affect them because they are blind." Occasionally, the other two monks can be heard saying: "The latest batch of silk is ready, brother Hridi." and "Brother Hridi, your homily was most inspiring." Also, when you have convinced Brother Holger to tell you about Savilla's Stone during the related quest he will beg: "Don't tell Hridi I said anything. I could be banished for telling you." This page was last modified on 22 June 2018, at 04:25.